It was a random day, I logged in to Goodreads and saw an interesting comment thread going on between my amazing GR friends. Intrigued I followed it and was introduced to ' The Age of Innocence I knew I'm going to read it soon, and in few months, here I'm! I'm not so sure if it's mostly a romantic read, or tragic; it seems all about Society. When a rain drop falls in the little puddle, dancing in its own perimeter, sending ripples around it, do you still call it a raindrop? No, it loses its existence to the puddle.. What's prominent is the lense you're seeing through at the puddle. It must be a view of one of those raindrops to get to know the puddle better. Meet Newland Archer, a well-read, well-bred, well-paid. ( oh, that's important in the Society) He's our lense, he'd guide us and tells us what to look for. But he's also that drop which is unsure of his place, rolling a lot, sending out a lot of ripples. Newland Archer is a representative of the modern age, rebellious, unorthodox, and a strong liberal conviction. And it's only possible for such a gentleman to met married to a beautiful girl like May Welland at a proper time. Only, if her mysterious cousin, Countess Ellen Olenska, with her scandalous past had arrived few days earlier. In Ellen, he finds what he has been searching for. He thinks they're ideal companions but he's engaged to be married with Mary. Here comes the irony of Society. Mary may let Newland, just for once, to go get whom he wanted. Ellen forces him back to where he comes from for the sake of Mary and in between the duty and love, his family and his passion, his dreams and the norms he keeps oscillating, his heart floating, searching for solace. The story, not so complex, but the characters are. And so is the Society. 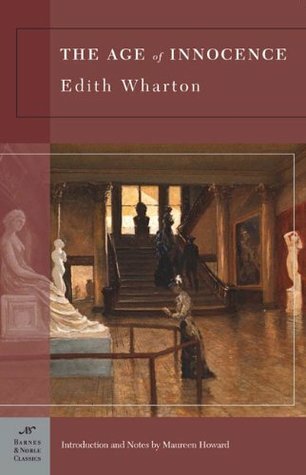 Seems Edith Wharton is mocking at it from a safe angle. Wasn't she too a wealthy, well read lady with strong convictions? Didn't she been misinterpreted in a way, thought of as a bohemian artist, divorced after having her share of unhappy marriage? Oh, it's irony not just of the golden age but even today. The individuals ahead of time we're always misunderstood. When Society doesn't understand things, rather than finding out truth, they often ridicule it. It's funny the way the behavior of Society is portrayed. Like, when wealthy Beaufort loses his money the Society is in distress and is relieved when they find signs of his well-being. Wharton very cleverly captures it in a single sentence. The most philandering Leffert is the one who keeps preaching. The characters are intricate. Newland seems strong yet keeps backing off. Mary seems ignorant but she understands things quite well and just keeps them to herself. Ellen is unafraid of anything but every time gives up when things come to her family and its reputation. I especially loved the cleverness of Mary and Mrs. Manson Mingott. Both the ladies surprised me in the way they turned out differently towards the end. Also in spite of her initial portrayal, Ellen is a very noble person. There's a lot more to it but I'd rather stop here on the conversation which I think captures the essence of whole book. "Poor? Why poor?" she echoed with a strained laugh. "Because I shall never be able to open a window without worrying you," he rejoined, laughing also. For a moment she was silent; then she said very low, her head bowed over her work: "I shall never worry if you're happy." "Ah, my dear; and I shall never be happy unless I can open the windows!" Sign into Goodreads to see if any of your friends have read The Age of Innocence. 30.72% "Wonder why I couldn't finish it earlier.. Maybe the initial character building is not very eloquent." 61.14% "“With a shiver of foreboding he saw his marriage becoming what most of the other marriages about him were: a dull association of material and social interests held together by ignorance on the one side and hypocrisy on the other.”"
72.29% "At length she said: "I believe it's because of you. "\n It was impossible to make the confession more dispassionately,or in a tone less encouraging to the vanity of the person addressed. Archer reddened to the temples,but dared not move or speak: it was as if her words had been some rare butterfly that the least motion might drive off on startled wings, but that might gather a flock about it if it were left undisturbed"
Kalliope wrote: "Interesting take of this novel which I read long ago. Leaving more ripples of interpretation..."
Thanks Kalliope, I'm not so capable of extracting the essence completely. Have left out so much but if I try doing proper review, it's going to span pages. There's so much to it. To cut it short was the only manageable option.